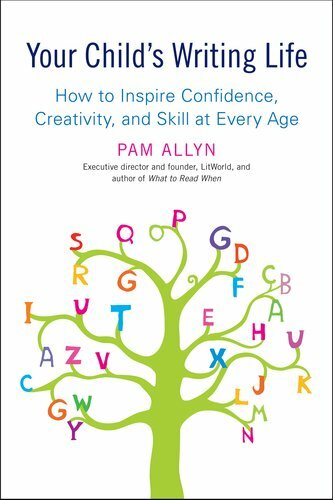 Allyn believes that writing is as important to a child’s development as any other fundamental skill, and that parents who help their kids become writers will foster their emotional, intellectual and academic growth. It is hard to argue with this, and there is a lot to love about this book. Allyn’s passion for writing is sincere, and so is her passion for helping children be everything they can be. Parents or teachers who want children to love writing will find much to work with here: a list of great children’s books to inspire writing, a chapter full of tips to help with times when writing is frustrating, myriad interesting prompts for child writers of all ages. I wish all parents would read this book and implement some of its general suggestions, because I suspect that, if they did, their teenage children would arrive in my classroom with, at best, a deep desire to write, and at worst, an appreciation of the written word and the impulses and skills needed to write something well. I have a single, but large, quibble with Allyn’s approach. My quibble is not based in any real expertise. I am not the target audience for this book. I am not a parent, and I don’t even teach children of the age described by the author. I was, however, a child, and a child who loved writing and continues to love it into middle age, so much so that I have dedicated my life to doing and teaching it. This is exactly what my parents did. They took writing seriously and never made me feel that I should be doing something else. If I was hiding in my room and they came to check on me, and I told them I was writing, they responded in the same way they would have if I’d said I was practicing my violin or doing my math homework: they praised me, and then left me alone. I’m a writer today in large part because my parents did everything right in that regard. However, they never set up “writing centres” or “word jars;” they did not create “writing routines” or set aside daily “writing time” or keep emergency writing implements in a folder in the car. This is not to say these approaches wouldn’t be useful for some children; they might certainly benefit a child who did not have an intrinsic writing obsession, as I did. I wonder, though, whether creating such routines and rituals might not risk turning writing into a chore, another homework assignment or extracurricular activity that needs to be slotted in. For example, Allyn asks parents to create a “perfect writing space” for their child – with the child’s input, of course. This kind of micromanagement – let’s get it exactly right together, and then you’ll be able to write! – can be anathema to creation, and to me it smacks of overzealous parental involvement. When I was a child, I would have found these questions, and their implication that there is a “perfect environment” for my creative process, overwhelming and intimidating. I would have preferred to be left alone in my room, where I would spread myself at my desk or on my bed or on my carpet, depending on my mood, or I might wander out to the landing at the top of the stairs or the hammock in the back yard. I would make use of whatever implements I could find around me or in the junk drawer downstairs in the kitchen. I was finding spaces and methods that worked for me, and my parents’ only role was to consider requests I made and fulfill them if they could. This feels queasily invasive to me. Why must a parent insert herself into a child’s experience to this degree? By doing this, is the parent not modelling something about herself and what she values, rather than the child’s interests? Why not cut words out and put them on your own desk? If the child can’t read yet, why not play with words orally, allowing her to choose the words you dwell on? When I reached this point in Allyn’s list of “ages and writing stages,” I began to wonder how a similar book about “your child’s math life” or “your child’s sports life” would read. Would it read, as I suspected, like a slightly unhinged manifesto in which every dinner hour becomes a chance to practice counting one’s peas, or every morning one turns getting dressed into calisthenics? The litany of ways to encourage writing was exhausting me in the mere reading, and I began to wonder if any parent really spends that much time in direct, active, engaged interaction with his or her child, much less in direct, active, engaged interaction that focuses entirely on getting the child interested in writing. What about just letting the child run around without making a story about it? Where would one have time for that? After a few days of Allyn’s program, I expect I’d be lying on the couch with a cold cloth over my eyes, unable to even keep my toddler out of the knife drawer, much less ask him what adventures the knives could be having in their drawer-house today. Which is to say: taken alone, any of these suggestions seems like it could help foster a child’s interest in writing. The key here, though, is in the words “foster” and “child’s.” There is a great emphasis on how the parent and child will embark on this writing journey “together,” but this “togetherness” eventually gives the book a cloying, claustrophobic feeling. It is understandable, if we are talking about a stay-at-home parent and a child of two or three, that the parent’s values and interests will take the lead and that the parent and child will share at least some of these writing experiences, but even at that stage, I suspect many children will benefit more from a gentle nudge and then some space to follow their own whims. What is more, some children do not enjoy reading and writing, and for them, such “encouragement” can start to feel manipulative and burdensome. Allyn does not seem to feel that there is any circumstance in which a parent should let “writing time” go in favour of other interests. How is this different from a parent who insists that his child will play football or join the Mathletes even when the child has no real interest in these activities? Allyn’s book seems dominated by a common parenting philosophy that equates “support” with “direction” (or perhaps control?) and I’m always concerned when parents invest themselves too deeply in shaping their children’s interests. Children who like reading and writing will read and write, and parents can encourage that by talking with them about reading and writing, and responding to their requests for books, notebooks, laptops if they can afford them, and so forth. If a child does not show an interest in writing, there are gentle things parents can do: fill the house with books, read and write themselves, suggest that the child write down the stories he tells at the dinner table. They can give the child a diary and see what happens. They can experiment with some of Allyn’s suggestions and see if they take, but I would be wary of promoting writing to such a child with the intensity that Allyn suggests, for fear of engendering aversion and resentment. There’s no doubt that writing a lot will benefit him, but so will playing a lot of basketball or learning a lot about astronomy. In the end, is it not best to expose him to lots of activities, let him pick the ones he likes, give him time to invest in those interests, and show respect and support for the ways he chooses to spend his hours, as long as they are healthy and promote his growth? So I think that, as parenting books go, this one is worth reading, and many of its suggestions are worth trying. I also think that parents should consider just being who they are, respecting who their children are, and reading fewer books on the subject, or at least viewing even the best parenting books with friendly suspicion. I value reading and writing above almost all else, and if I were a parent, I would have to resist the temptation to embrace Allyn’s advice whole hog. I might even set up a “writing corner” or have occasional “writing evenings” with my children in the hope that my love of writing would infect them. But I would not expect my children to fall in with the program, although I might learn a lot about them in the process. Allyn, Pam. Your Child’s Writing Life. Avery (a division of Penguin Writing Group USA,Inc.) New York: 2011. Thanks for your comments about this book. I still see parents doing this type of thing, with both reading and writing, at the middle school level. I believe the term “helicopter parents” has been coined for this kind of intense direction. Better to model the behaviors you want (without forcing them) and to litter your home with the stuff of writing — but be prepared that what you see as the tools to write, your child might see as building blocks or game pieces. My daughters would build extravagant paper sculptures out of paper and tape, decorated with pencils and crayons. Then, she would tell me wondrous tales about these sculptures. Today, an 8th grader, she has no interest in art . . . but she does love writing. It just happened! I suspect I’d agree completely with your take on this book. Framing words from magazines and putting them on the kid’s desk? Reading aloud from grocery lists? Sounds a bit like the parents don’t have enough, y’know, actual “books” around to read from. (Although with the rise of e-books, that may be the case.) If you’re regularly reading those old-fashioned things with words on paper and have plenty of them around the house, that should be enough. As for building up a kid’s love of words, my kids seemed to benefit from my constantly rephrasing things. From when they were babies I’d use a string of different words to refer to the same item or concept, mostly just to make sure they understood what I was saying. And they love sounds and wordplay, but who doesn’t? Do you think this book is aimed at parents who know writing is “good” but don’t really know how to go about fostering an appreciation? Maeve: that’s a good question. My sense it’s aimed squarely at parents who love writing and want their children to love what they love, who believe what the author believes: that writing makes you a better, smarter, more emotionally engaged person. Such parents probably have ideas about how to foster that love, from their own experience, but this book provides a detailed road map (and one that is, in my view, a bit much.) I think a parent who loves writing will enjoy reading this book, and will probably find it inspiring. I don’t imagine most parents will throw themselves wholeheartedly into it and its instructions. As a mom to four kids I have home schooled off and on, I can see the benefit of some of Allyn’s suggestions for less motivated children. But there are other approaches that are much more open-ended and fun. Take books of “story-starters,” for instance. These books often just have an opening paragraph or an interesting picture and children can start writing from there. In general, though, I think children like to have some privacy when writing. For instance, I just found out that my 16 year old daughter has been keeping a blog. She finally shared that information with me, but asked that I not make any comments about her content or writing. They need their own space and freedom to hash through their own ideas. And since she won’t be reading this comment, I can say here that I found her blog delightful! I agree with your point about privacy, Damommachef. My issue with many of Allyn’s suggestions was the constant presence of the parent – this seems to me to be more for the parent’s benefit than the child’s, as much “helicopter parenting” will demonstrate. That said, she acknowledges the child’s need for freedom; it’s just that the thrust of her book doesn’t entirely support that. I’m glad your daughter is blogging! I love hearing that kids are putting their writing out into the world. Helicopter parenting is a definite temptation, and seems to be the trend more often than not. In fact, I feel that sometimes people look down upon parents who let their kids take consequences for their actions–especially when they could have helicoptered them out of it. But how else will they learn? Yikes. This is not just intrusive parenting, it’s almost psycho. What would she do with a child who wanted mostly to tinker with motorcycles (this describes a nephew of mine, who was making money at the age of 7 by fixing motorcycles and now makes a good living at it). Any child who would tolerate this level of micromanagement is either seriously dependent or afraid of the parent. And, need I add, almost certainly a girl, not a boy. JB: I should emphasize that I’ve picked out the most extreme examples here. That said, I do feel there’s an assumption in Allyn’s book that you have picked up on: that writing is a much more valuable pastime than something like fixing motorcycles might be. I agree with your feelings that some of the practices described here seem a bit invasive and counter-productive to creativity. That said, as a high school English and Creative Writing teacher, I WISH some parents would A) help their kids learn to write well (even if they can’t write well themselves there are ways to give kids resources to help them, and B) encourage kids who love to write (I have had many parents knock down or disregard their child’s dream to become a writer, saying that they must grow up and get a “real” job). Sounds like an interesting read. I wish there was one geared for older children (high school/young college). TG: I agree: the book is well-meaning and I’d certainly love to know that parents were supporting their children’s writing efforts too much rather than too little. As for the book geared for older children: sounds like a project for you! I must surely be an anomaly of some kind. No one in my family ever read aloud to me. (Captain Kangaroo was my only source of the spoken word in that regard.) Yet I had started to read by the age of two, and was writing stories, plays and poems in my preteens. What my father did do, however, was fill the house with books, so that the importance of the written word was made quite clear to me. Not a total anomaly, I don’t think, Paul – I know a number of writers, including my husband, who grew up in similar circumstances – but it is a testament to your desire to read and write, and to the power of the physical presence of books! I’ve heard of studies that look at the presence of books in the home as a predictor of a kid’s development. It provides a lot, even when other factors (cleanliness, protection from environmental hazards, household income) are seen as lacking. My husband and I are both avid readers, and I have ended up with children who all love to read. I think one of the best determiners for learning to write well is loving to read. I can tell, when I read student papers, which students read and which don’t. My poor house is bursting with books–we have a bookshelf in every room including bedrooms. Traditionally they get a pile of new books for birthdays and Christmas. That is one thing I felt I did right. I have made many mistakes as a parent but this was not one of them. I have four children who value the written word, and as high schoolers, can write better than most of my college kids. Now, if only I could get them to clean their rooms……always get along….etc., then I would have it made! A thoughtful and insightful review. There’s a fine line between nurture/encouragement and making creativity a task on one’s To-Do list. Thank you, Debra – i agree that the line is indeed a fine one. Although I haven’t read Allyn’s book, I appreciate your perspective and probably would have the same reservations about it. I have to wonder if there are two lines being blurred here – the one between nurturing and domineering and the one between parent and teacher. Some of the practices Allyn suggests might be good ideas for teachers to use in the classroom (e.g., create comfortable and inviting places to write, devote time in class for writing, etc. ), but would be overbearing coming from a parent. By the way, I love the new look of your blog. I entirely agree – and would add that there is a line between “play” and “work” that is also being blurred – not that this is always a bad thing, but if writing veers too far from play, and becomes a chore, what are the chances kids will continue to take joy in it? And thanks for the comment on the blog look – I thought it was time to change things up! “I was not asked if I wanted a typewriter. It was I who decided it was time for me to have one.” ….and THAT is a perfect world. You do realize that you are exceptional, don’t you, Siobhan? I have three children. One believed that a blank book was the best gift in the world. One thought a blank book was okay as a work tool, not a gift; she preferred science. A third tested so low in first grade that I was told to never expect anything, to plan a vocation that does not require reading or writing, to be happy if he achieves 8th grade level because he will have worked as hard as most people earning doctorates. I completely agree with your recommendation to respect who your children are. Just know that once in a rare while, a season of micromanaging fits who a child is. It took a helicopter rescue for this one. This week he began his second year of college with a 3.53 GPA. DP: This is an inspiring story! And it demonstrates your point very well. I agree – and I think this is true not only for children with special challenges. Maybe we all do need a bit more encouragement and structured prompting in areas where we don’t have a natural ability. Thank you for chiming in. Sounds like a very interesting book but parents may want to pick and choose which suggestions will work best for their child. Like you, I was a voracious reader and writer who simply wrote anywhere and everywhere and my parents, like yours, encouraged this. My brothers, however, were much more reluctant (and still are) to write, so perhaps some of these ideas could have helped my mom convince them that writing was fun. KBW: I think the “fun” element is what’s really crucial. Where small children is concerned, the more we can inspire a love for writing (as opposed to making it into a chore), the more likely they are to explore it in their own ways…thanks for commenting!